Recently, a friend e-mailed me an Op-Ed article by The New York Times columnist Roger Cohen written around the question. Sitting in the shade of fruit-laden orange trees on the back patio of a rented house in Ajijic, the Mexico village where my husband, Hank, and I have lived part time since 1996, I ask myself what I would do. It’s an ordinary, sunny Saturday. A peppy ranchero beat wafts across the lazy afternoon breeze alongside recurrent strains of chattering songbirds, barking dogs and the peals of children’s laughter. From a rooftop terrace that overlooks our backyard garden, a neighbor yells down to invite us to dinner for Pascua (Easter). The air smells wonderful, like citrus and roses, like warmth and earth and sweetness. In such blessed circumstances it’s difficult to contemplate the internal chaos that a fatal diagnosis would surely trigger. A despair as far removed from my current contentment as can be imagined. Yet the question nags at me. My initial, “Would I leave Mexico?,” soon yields to the deeper inquiry “Would I—in fact—choose to be anywhere other than where I am?” My gut says no. When Hank and I left the United States for Latin America, we thought we’d be gone a year—two at the most. At the time, a nomadic lifestyle in which we moved from one country to another was only a vague idea full of promise and excitement. We’ve been away three years now and have no idea when, or if, we will go “home”—or what that even means anymore. For the next few days, as I meet my Spanish tutor, Alejandra, at the plaza for conversation and coffee, as I stop to buy fresh avocados and mangos at the corner frutería or sit beside Hank at the glass-topped wooden door that serves as our makeshift writing desk, I feel a certain euphoria. I’m not worried about success or approval or our future—I am merely myself, alive in the present moment and content in a way that feels rare and raw and pure. The plaza, Ajijic, Jalisco, Mexico. After a while, the elation fades. I can feel anxiety tugging at me as persistent feelings of guilt and unease vie for my attention and the path leads back to more questions: Can looseness and connection co-exist? Can we be itinerant and transitory yet still feel rooted, deeply and firmly? The anguish, confusion and isolation of “outsider-dom,” as British literary critic James Wood calls it, had been ever present, if not acknowledged or understood, for much of my life. And, unbidden, it had traveled with us to Latin America stowed away in the bottom of my suitcase. To the people we met in Mexico, Nicaragua, Ecuador and Peru, I must have looked like an ordinary American: a chirpy five-foot-six, blue-eyed blonde with a kind smile. But inside, beyond the persona, there was an internal swamp of doubt and insecurity regarding my place in the world. Beyond the snug comfort of Hank’s wholehearted love, cherished friendships and solitary pursuits, I rarely revealed my true self. The journey of these past three years has been the coming to terms with that ambivalence and learning to feel at home in myself. As my skin grew brown, my hair turned golden and the excess weight I’d carried for years melted away in the heat of Latin America, I began to feel a sturdy satisfaction in the simple pleasures of our foreign existence—walking miles each day, eating unfamiliar foods, enjoying a lazy siesta in the warmth of the afternoon sun or watching the moon rise over an unexplored horizon. I didn’t expect to stumble upon this sense of belonging so far from home. But amidst the chaos and noise and color here, I finally got that “outsider-dom” is more feeling than fact. Perhaps because I have been so actively living a life—for the first time—with no sense of performance or expectation, I was free to let the veil of separation drop. I can see now how I was the only one who judged my need for solitude as divisive. That I was the one who felt unworthy and that by projecting my insecurities onto others, I isolated myself. And that if I wanted to feel accepted, I had to find it first within myself, even on the days my fattest pants won’t fit, even when I blow off writing for a nap in the sun and on the days when critical and doubting thoughts buzz around in my mind like an irritating mosquito. Earlier this month, we began making plans for our next adventure. We mention our pending transition to friends at Cafe Grano, the Ajijic roastery where we meet for coffee most Saturday mornings, and it triggers a flurry of ideas and recommendations. “Remember Roger? He moved to Chang Mai and loves it,” one says. “Howard and I are headed to Bali for two months. I think you’d like Ubud,” another suggests. “What about Costa Rica?” Hank asks, not for the first time. “I”m curious about Colombia,” I say, dodging the Costa Rica suggestion for reasons I can’t quite explain. Something in the impromptu conversation brings my thoughts back to the unanswered question of where I would go if I only had a few weeks to live. Would I want to head for Chang Mai, Bali, Costa Rica or Colombia? Would I feel compelled to return “home” to America? I suddenly realize, with great clarity, that I wouldn’t go anywhere. That I would stay put. That wherever we are is enough. The fierceness of my conviction is unexpected and I am surprised by the tears that roll down my cheeks. I quickly wipe them away. Hank leans in to whisper in my ear. “You okay?” There’s confusion and concern in his eyes. I nod yes and excuse myself to the restroom. When I return, he reaches over to cover my hand with his. We sit like this for some time, engulfed in the convivial company of friends. I realize how at home I feel. We walk back to our temporary house in relaxed silence, navigating the uneven sidewalks and stone streets with a familiar ease as we dodge telephone poles, protruding electric meters and the dog droppings of the town’s many free roaming pets. We separate often, stepping into the street to yield the sidewalk to families and ancianos (elders), rejoining again after they’ve passed. 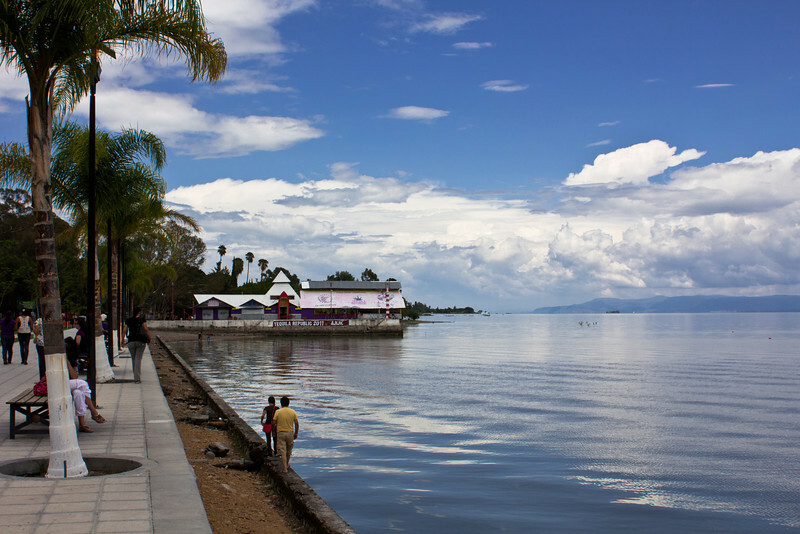 The steep foothills of the Sierra Madre mountains that tower above the village are brown and brittle before the summer monsoons arrive to turn them an emerald green and send torrents of water gushing down the slopes and streets to the awaiting Laguna de Chapala (Lake Chapala) that anchors the town. How do I explain to this man I love how much this journey together means to me? Does he have the slightest idea how much it has changed me? I hadn’t considered 24 years ago, when he seemed as unlikely a mate as I could imagine for myself, that beyond my fears about success and finances and our future, I might find an inner stability that could make it all disappear, even if only for a moment. “You’re my favorite wife you know” Hank says into the silence. A smile settles across his face, his eyes creasing with mischief. I laugh, even as I blink back tears behind my sunglasses. Typical Hank, letting me know it’s going to be okay. That I will be okay. What about you? Where would you go if you only had a few weeks to live?Use the comment box below to share or join the conversation on my facebook page. I’d love to hear your thoughts.